"Mortals have always shown more interest in gods ever have in mortals. "Generally speaking, gods desire nothing but adoration." 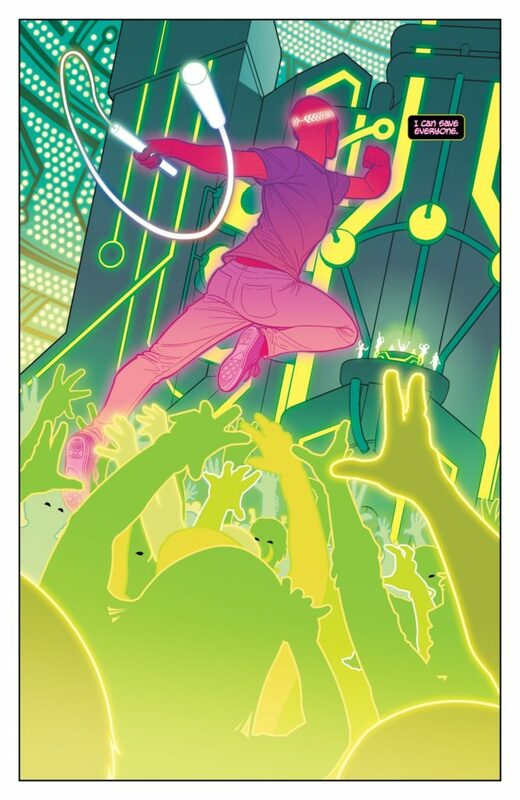 Every 90 years a Pantheon of a dozen gods is born anew, activated and guided by ancient Ananke who finds them in overwhelmingly young individuals previously oblivious to their potential or fate. This is to be loved and be hated and to shine like stars and - within two years - to be quite, quite dead. In this modern incarnation one element in that equation has now changed irrevocably, so that none of that sentence remains necessarily true, except this: they were each born anew. They retain none of their previous experience on which to formulate priorities or base a sense of perspective. Now a balance has been broken, the trajectory changed. Warnings have gone unheard or unheeded. Those who are left behind are flailing in their newfound freedom, some falling into unthinking, untempered hedonism regardless of the cost to others' hearts, and fighting each other because they can. And because power. All of that power is intoxicating and addictive, both to witness and to wield. Even the mildest amongst them are flashing their metaphorical teeth. Also, can you imagine having been someone else? Perhaps you once were. Perhaps all of us once were, to some extent, after a teenage transmogrification, but few of us have survived this sort of schism. That is one of the keys to Kieron's success in making this pantheon of elevated individuals so very familiar and therefore intriguing: they are as emotionally vulnerable as those of us less exalted. Conflicts aren't just battles you have with other people. 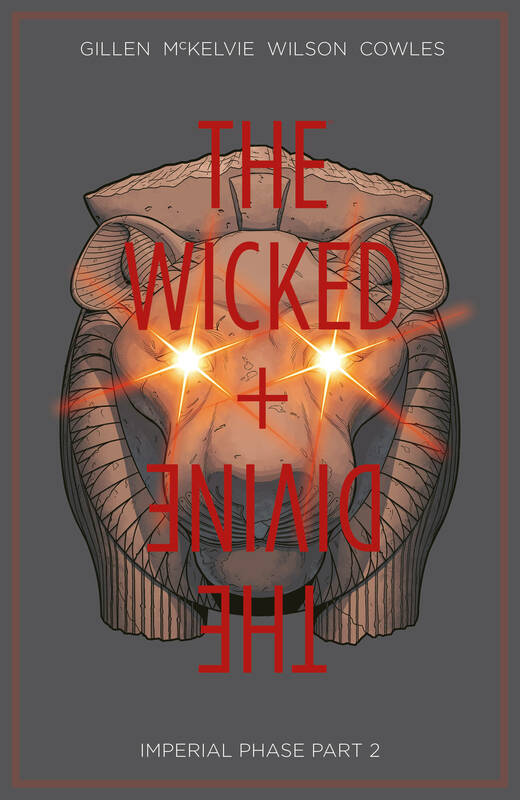 That is radically different to the way I've previously sold THE WICKED + THE DIVINE both on the shop floor and in extensive reviews. Do please check those reviews out if you are new and intrigued, because by this point we are trying our best to avoid spoilers while still luring new readers in to what is already one of our biggest selling series of graphic novels alongside SAGA, LAZARUS and anything by Brubaker & Phillips like CRIMINAL, FATALE, THE FADE OUT or KILL OR BE KILLED (all reviewed too). Speaking or Rucka and Lark's LAZARUS, however, that series contains within (I will not say where) the most successful sleight of hand I have ever encountered in comics so that, upon reading the final page of volume four, you will be compelled to re-read everything up to that point. Similarly (similarly - ha! 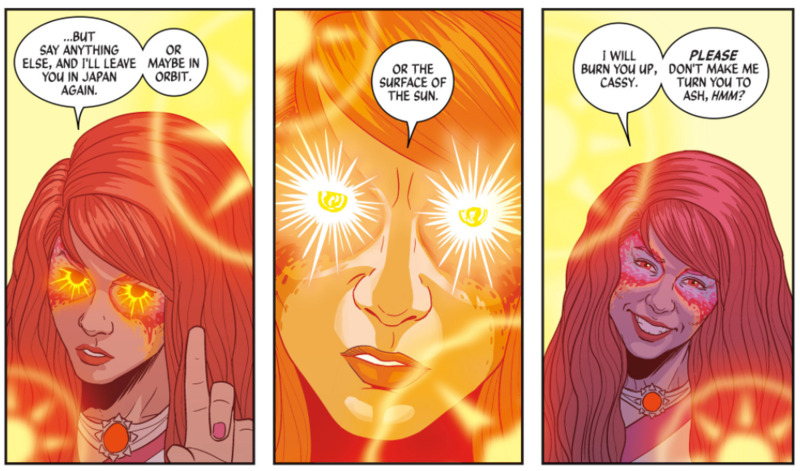 ), THE WICKED + THE DIVINE contains a dozen such sleights of hand to this date. Let me elucidate without explaining: there are a good half a dozen sequences which, as you read them, you will take as read; but what you have witnessed is not what occurred. Then there's the retrospective reveal and each one holds water: hindsight can be a miraculous thing. However, let us return to power as "intoxicating and addictive, both to witness and to wield". 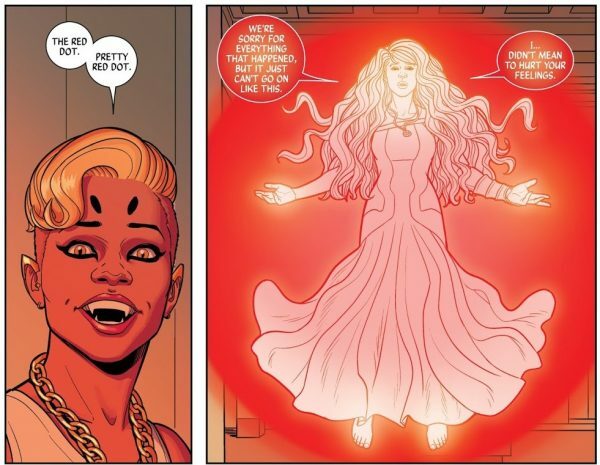 None of this intoxication - of modern mortals relishing gods in their midst, or of these petulant powerhouses getting high on their own supply - would be remotely credible were it not for McKelvie and Wilson delivering on the awe-inspiring wonder front. Between them they have managed to channel what is chemically psychotropic into its visual equivalent and equal. I once saw Goldfrapp perform while I was stone-cold sober, yet I could swear that I had necked ecstasy on top of elephantine quantities of speed. 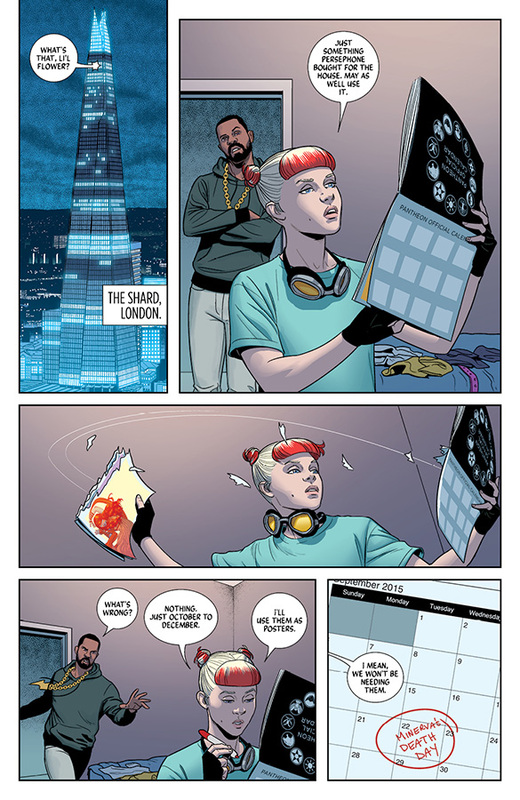 So it is here: what McKelvie and Wilson present on the pages is mind-altering and mood-altering, yet legal. 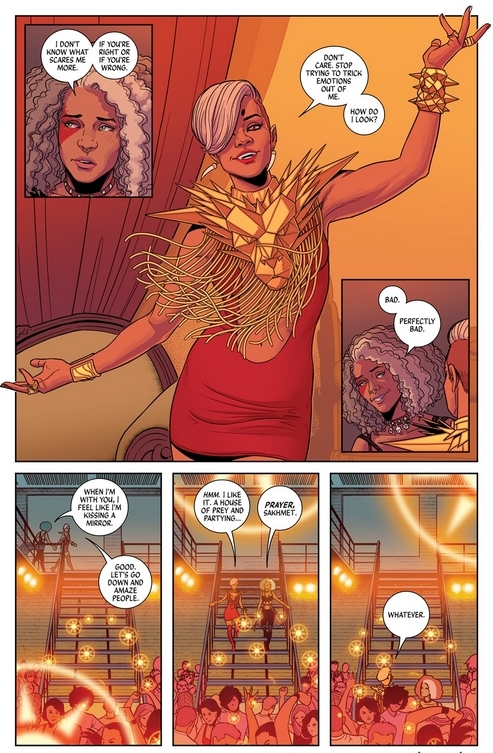 Almost every volume of THE WICKED + THE DIVINE comes with an extensive back-matter process piece wherein you are given a glimpse as to how the creators between them conjure (and I use that word with precision) effect after effect whose affect is nothing short of alchemical. It's far easier to talk of this in terms of adrenaline effect than it is to specifically parse or prise apart its constituent catalysts. Or at least, it is for someone like me: I'm a writer, not an artist. I'm still reeling from the day-glo. But its day-glo is colour-coded, for example, to each individual's propensity or power set, subconsciously informing you whence it came: its instance of origin. See Dionysius's crowd-leap of faith. Letter artist Clayton Cowles manages much the same thing in his cuing and so cluing: each individual has a unique signature speech which leaves the combined creators room to keep the free-flow show rolling without having to provide expository asides that would otherwise ruin your immersion. What I am trying to impress upon you is that this is the most modern of multi-creator comics. It is all-embracing and all-inclusive not only in terms of its protagonists and audience, but in its cooperative cohesion when it comes to sequential-art storytelling: each element is understood as equally important and each uniquely-skilled contributor invited to give of their therefore informed and very best. This is generous storytelling. It reaps rewards. Which would be a fine note on which to finish any review but there's a couple of action panels that I am particularly fond of this issue, when it is usually the nuanced conversations which I enjoy most, accompanied by equally subtle shifts in expressions which are evidence of an actor/director (the best artists are both) at their peak. 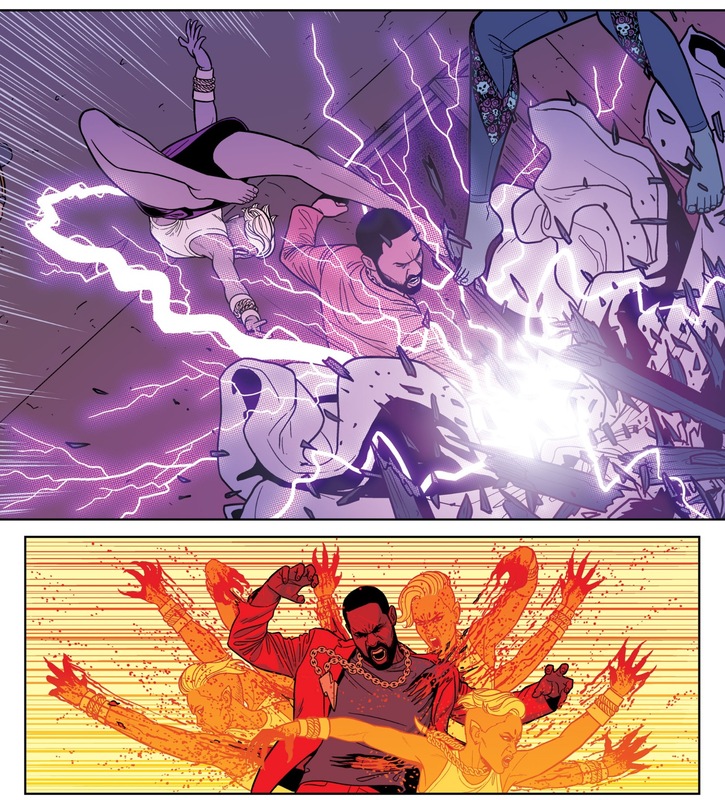 In the first, lightning strikes, in the form of Baal punching down on a bed. A split-second earlier, on it lay Sakhmet and Persephone. Persephone is thrown back by the force, but she wasn't Baal's target: his fist was aimed squarely at Sakhmet. Sakhmet is a lion-warrior goddess and I don't believe that Baal was downwind. Such are her instincts and agility that she is already back-flipping behind Baal like the lithest of Olympic-level athletes on high-jump. That image alone is a triumph of action/reaction kinetic form and balletic grace, never mind its immediate, skin-shredding successor. But that's not actually my point. 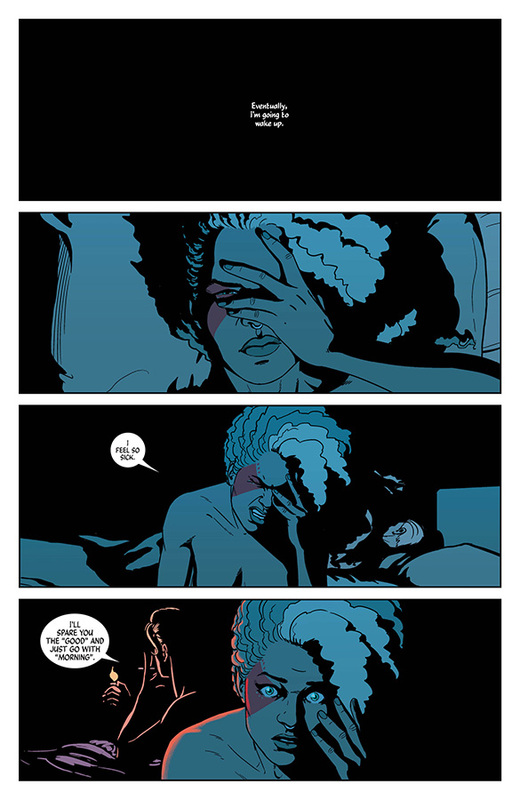 My point is the contrast between that and a panel in the second, earlier chapter when another woman is discovered by Baal in bed, dressed in tribute to Sakhmet. She is beautiful in her own right, but neither her build nor her poise possess any of the prowess that it would take to elude a similar strike. Nothing needs explaining: the visual is all you need to alert you in an instant to this mistaken identity. Still, she does have quick enough wits to ask for an autograph.